This mid century home is located on top of a beautiful hill top acre featuring amazing city views that stretch across Oro Valley 45 miles to a distant view of Picacho peak. 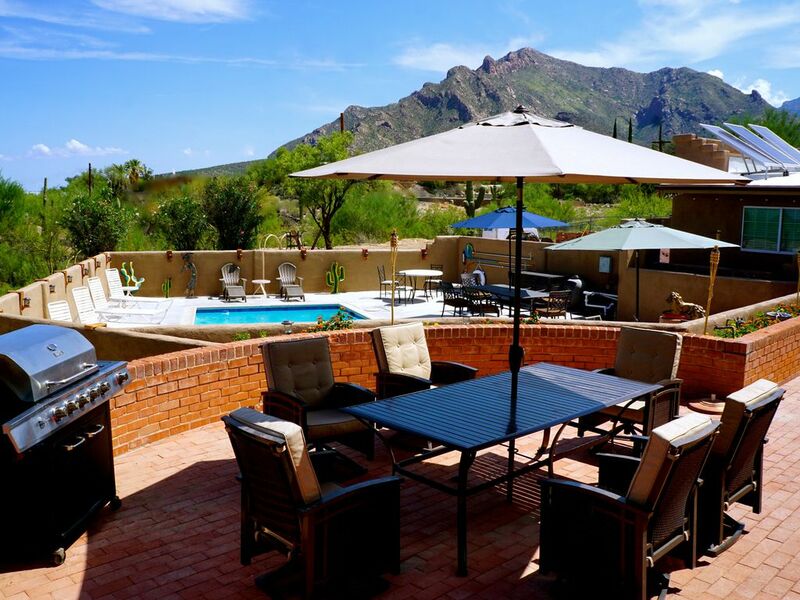 On the other side are stellar views of Pusch Ridge and the Catalina mountains, so close, you'll feel as if you can touch them. Bask in the jacuzzi while taking in the beautiful scenery. Walk or drive just 3 minutes through the neighborhood to the Pima Canyon trail head. Shopping and restaurants are just below this hill top location. Hi my name is Ted. I'm a laid back guy who can generally be found sitting in front of a big ribeye steak and some veggies. I love restoring old cars, home improvement and travel. I'm the father of five children and 8 grand children. My children all grew up here at Royal Suffolk making this place very special. Old style, use at your own risk, see instructions. Private and exclusive pool area. We had four guys in for a golf trip. The house was a far better option than four hotel rooms at a resort. Good location. Plenty of space. Beds were comfortable, Good wifi. Door access super easy with the code. Owner very responsive. Minor downside is that there are only two bathrooms but still a great place to stay. Would definitely book here again. Everything we wanted for our Tucsan family vacation. House fully equipped and comfortable. Owner could not have been more attentive to details. We highly recommend this property. Absolutely superb, you cannot possibly go wrong by staying here! We all had an amazing time staying here, the home is clean and so comfortable, the facilities are perfect from the beautiful fire in the lounge that makes you feel relaxed and cosy on a cold evening, to the beautiful views all round, this home is amazing. The hot-tub was a very welcome addition, early morning dips whilst watching the sun rise and late night dips looking up at the stars ... magical. Ted could not have been more welcoming, as a group of Brits, we are used to cups of tea in the morning, so when Ted found this out, a kettle was delivered immediately - what a wonderful host - Ted .. THANK YOU!! We really mean it when we say, you cannot go wrong staying here! Thank you Ted for a wonderful experience here in Tucson. The home and facilities are impeccable and we will look forward to renting again next year. This mid century home is located on top of a beautiful hill top acre featuring amazing Oro Valley city views that stretch across the valley 45 miles to a distant view of Picacho peak. On the other side are stellar views of Pusch Ridge and the Catalina mountains, so close, you'll feel as if you can touch them. Walk or drive just 3 minutes through the neighborhood to the Pima Canyon trail head. Shopping and restaurants are just below.